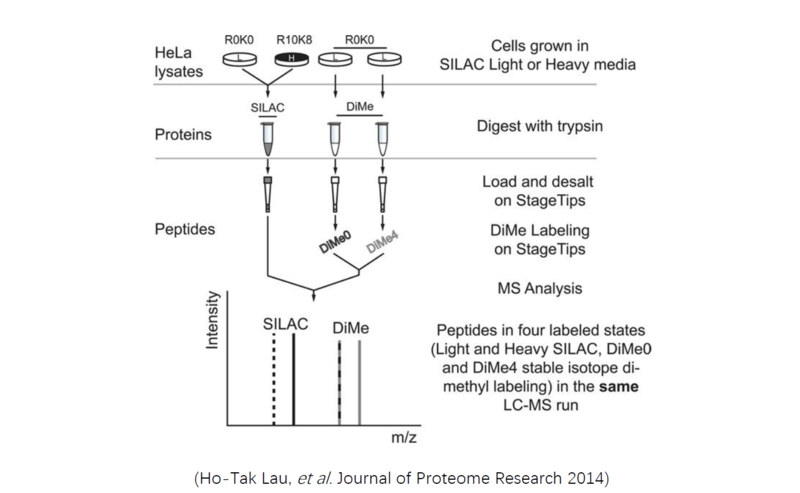 Stable Isotope Labeling By Amino Acids In Cell Culture (SILAC) is a relative quantitative proteomic technique, which combines metabolic labeling with mass spectrometry analysis. In this technique, cell samples are labeled by culturing with light, middle, or heavy isotope labeled lysine and arginine. 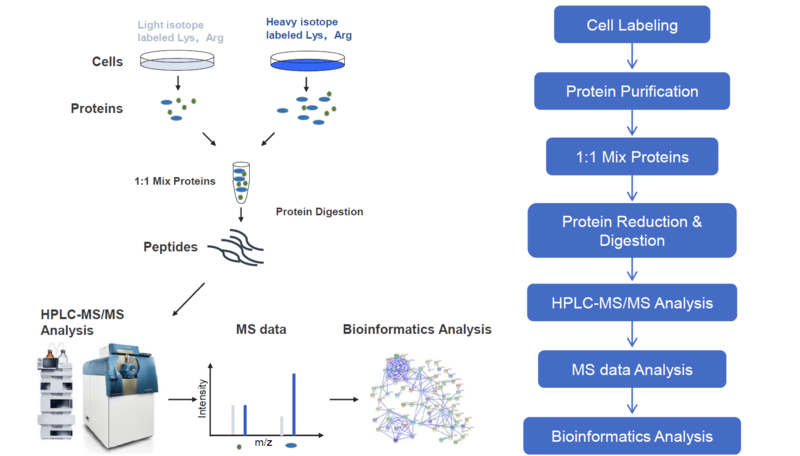 Since property of proteins is unaffected by the label, different cell samples are mixed at early experimental stage followed by LC-MS/MS analysis, eliminating any following intra-experimental variability involved by differential sample preparation process. Hence, SILAC is a powerful method to study the relative proteomic change under differential treatments. Similar to SILAC technique, Dimethyl labeling is also an isotopic labeling method. However, Dimethyl labeling is a chemical labeling process, and labels lysine or the N-terminal amino acid residues on peptide, instead of labeling proteins. Except for the difference in labeling method, SILAC and Dimethyl labeling technique have comparable sensitivity and accuracy, and are being more and more widely used in relative proteomics studies. MtoZ Biolabs has developed a specialized platform, equipped with Q Exactive HF (Thermo Fisher), Orbitrap Fusion, and Orbitrap Fusion Lumos mass spectrometers equipped with Nano-LC for SILAC/Dimethyl analysis service. To better solve your research problems, we offer an all-inclusive service, including cell culture, cell labeling, protein purification, digestion, peptide separation, LC-MS/MS analysis, and bioinformatics analysis. All you need to do is to tell us your project objective, and send us your cell samples, and we will complete all the following experiments. • Cell samples: frozen cells (shipped on dry ice), which can be passaged for at least 5 times. • If you can finish the cell labeling and cell stimulation steps, we also accept labeled cell and protein samples. In this case, proteins should be of 50-100 ug/sample, shipped on dry ice. Based on the comparison of SILAC and Dimethyl labeling methods, reproducibility and stability of SILAC are slightly higher than that of Dimethyl labeling, as in SILAC proteins are mixed before digestion, and less interfering factors would be involved. However, as a cost-effect quantitating method, dimethyl labeling is an competitive choice.